Please click on the image to see the full size document. Please report a lost or stolen card promptly to the library, as anyone in possession of your card may otherwise be able to use it. Keep your card secure, as you would a credit or debit card. Click here to look up materials, check your account, or place a hold from home on ValCat. Do you need help with a question and Google just isn't giving you what you need? 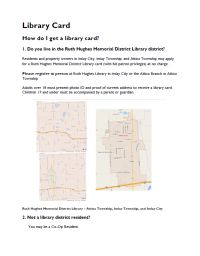 You can ask for help in person at both branches of the Ruth Hughes Memorial District Library or by telephoning either branch. The Imlay City Branch of the Ruth Hughes Memorial District Library has a conference room for public use. Library events have priority over all other events and the library reserves the right to refuse reservations for the room at any time. Call 810 724-8043 to reserve the conference room. Click here to print a copy of Application for Use of Conference Room. Click here to print a copy of the Conference Room Policy. There are two quiet study rooms which are available to reserve by calling 810 724-8043 or stopping by the front desk. These rooms do not require the conference room form, but can be reserved. If no reservation is made and/or kept, use of the rooms is available on a first-come, first-served basis. Please note: due to high demand, the conference and study rooms will only be held for 15 minutes past the reserved time. A fax machine is available for the public to send and receive faxes at both branches of the Ruth Hughes Memorial District Library. Fax service ends 15 minutes prior to the library closing. The fee is $2 for the first page and $.50 for each following page. Faxes sent outside the United States may be charged an additional fee. The Ruth Hughes Imlay City fax number is 810-724-2602. The Ruth Hughes Attica fax number is 810-724-2007. Both branches of the Ruth Hughes Memorial District Library provide public access to photocopy machines. The fee is doubled for double-sided copies. This rate also applies to patrons supplying their own paper or transparencies. Both branches of the Ruth Hughes Memorial District Library offer access to computers and the internet. At Imlay City, 13 computer stations are located in the lab, and a laptop is available for use within the library, while the Attica branch has 2 computer stations. Both branches have wireless internet access. Internet, word processing, and web e-mail are all available to library cardholders. Printing costs 10 cents for black and white printouts and $1 for color printouts (Imlay City only). Computer access and printing ends 15 minutes prior to library closing. Computers will not be available to the public when the library is conducting computer training in the lab.